A former water mill situated in a wonderful position on one part of a 2.5 acre farm. There is not another house to be seen in the immediate neighbourhood. 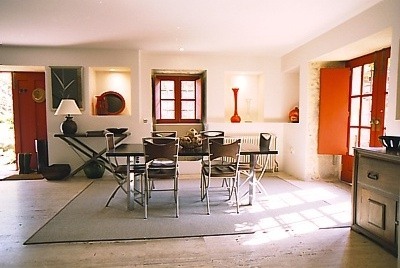 The mill dates from the XVIII century and was recently converted into a delightful holiday villa ideal for small parties. 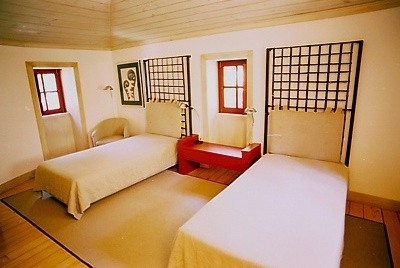 Surrounded by eucalyptus, this cottage has been tastefully decorated to the highest standards and one of the main features is the water course along and under the mill which has also been preserved in order to maintain the original atmosphere. 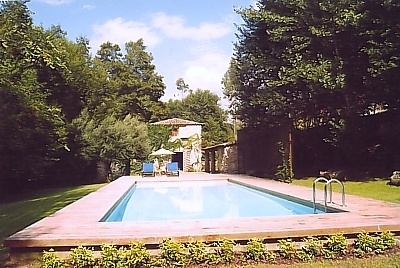 The newly built pool is set in the lawned well kept garden. The quiet, countryside location of the cottage makes it the perfect choice for those wanting peace, relaxation and luxury. The village of Povoa de Lanhoso about 7 kilometres away has restaurants, shops and a large weekly market. A visit should also be made to the 11th century castle. 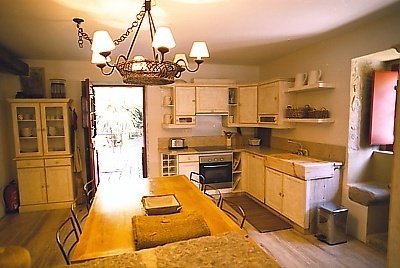 To the right of the entrance hall is a fully fitted kitchen with breakfast table. A door leads onto an outdoor terrace overlooking the river stream. To the left of the front door the entrance hall opens into a dining room and with doors opening onto a stone terrace ideal for outdoor dining. A couple of steps brings you to the living room with comfortable seating (sofa and two armchairs), open fireplace, satellite TV and music centre. Door opening out to small balcony overlooking the stream. Steps leading up from the entrance hall to the bedrooms area. Twin bedroom with ensuite bathroom. 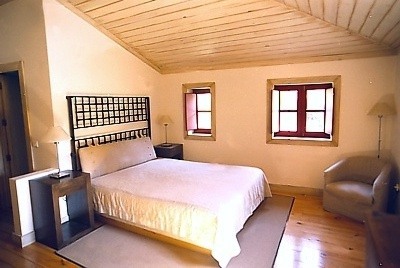 The second bedroom has a double bed and an ensuite bathroom. Views over the swimming pool and front garden. The mill benefits from central heating making it an all year round destination. Beautiful extensive garden with table and chairs for outdoor dining. Small annexe with shower room and toilet. The swimming pool is surrounded by a wooden deck sunbathing area. Dimensions are 11 metres long and 4,5 metres wide. The depth is from 80 centimetres to 1,55 metres. This property is not suitable for young children. There are unprotected drops around the swimming pool, river bank and terraced areas of the property. Within the property there is a separate 1 bedroom self contained cottage with private swimming pool which can accommodate and extra 2 persons. 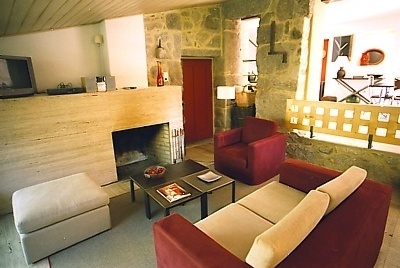 Clients have the option of booking the watermill and cottage, the watermill only or the cottage only. Prices are variable as per the number of units booked. If only the watermill is booked, the cottage may be booked by another party however each unit has a private swimming pool. No shared facilities! Price includes: Electricity, water, weekly cleaning (including bed linen and towels), final cleaning and taxes.